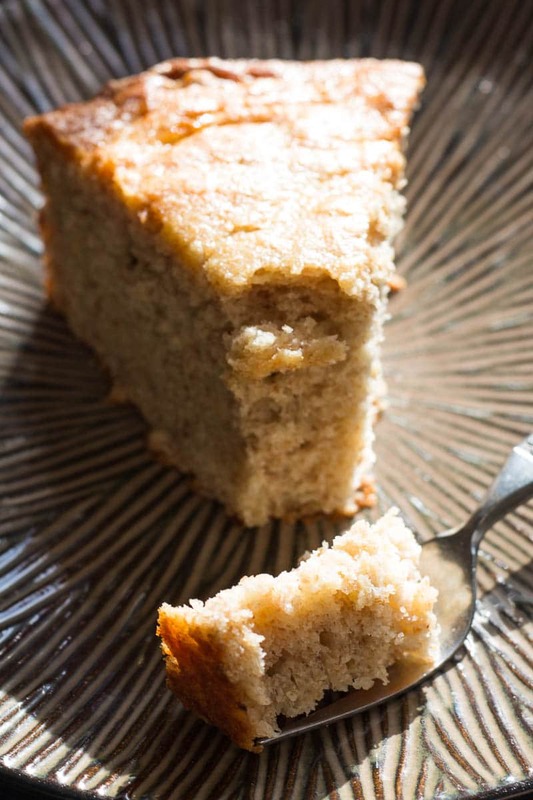 This banana bread cake is moist, flavorful, and has just the perfect kick of dark rum. It’s the banana bread cake of your dreams! Ever since I started baking from scratch, I’ve wanted to find a good banana bread recipe. I tried at least a half dozen recipes for banana bread, but each time something was lacking. I also discovered that I prefer to bake banana bread as a cake, because it gives you more of that lovely, slightly sticky top that has the most wonderful texture. After experimenting on and off over the course of a year, I’ve finally found a winning banana bread cake. This banana bread cake, like my favorite pound cake, is built on a flavorful base of sour cream and butter. Sour cream is truly magical in baking. If you haven’t tried it in your cakes yet, you owe it to yourself to start today. I test baked the recipe once, then decided to kick it up with a good shot of dark rum. Have I mentioned that dark rum is also magical? Like any baked good with alcohol in it (such as these champagne brownies), this banana bread cake only gets better as it sits overnight. Try it for breakfast and you’ll thank me. This banana bread cake recipe calls for a bit of all purpose flour and a bit of whole wheat flour. That’s because I actually like the nutty flavor imparted by whole wheat flour. However, if you don’t like whole wheat flour (or don’t have any), simply use all purpose flour for both amounts. 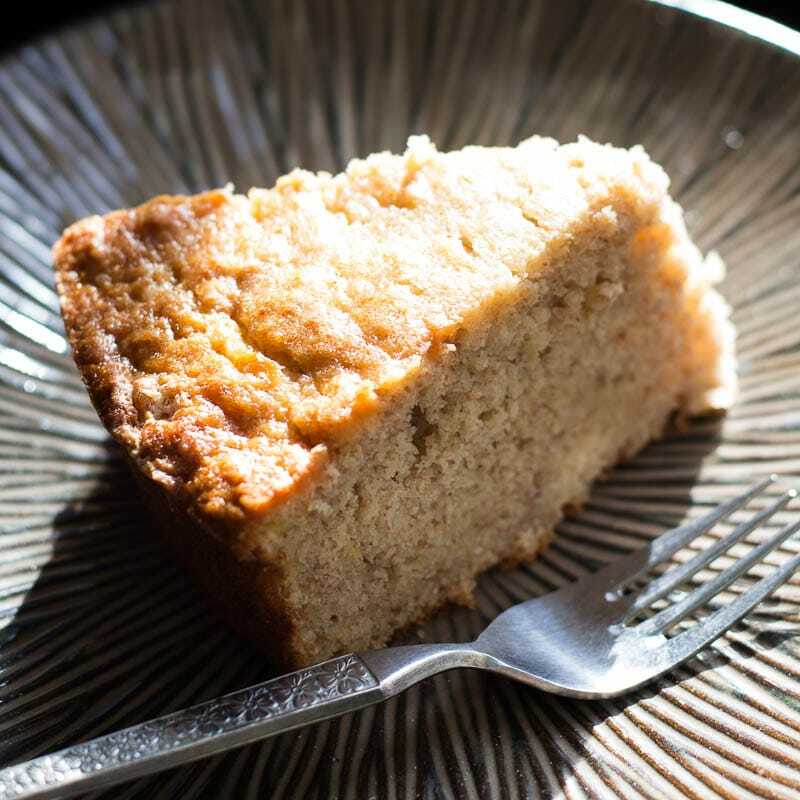 I love the texture of this banana bread cake so much that I don’t add nuts, but if you would like to add some, feel free. I would scoop out a bit of batter first, because this banana bread cake bakes up really tall and thick, and you don’t want it to overflow the cake pan. Moist, flavorful banana bread cake flavored with dark rum is the perfect treat for dessert, or even for breakfast! In a separate bowl, stir together the flours, baking powder & soda, and salt. Set aside. In another bowl, combine the bananas with the rum and mash until the only lumps left are very small ones. Add the dry mix and the banana/rum mix to the large mixing bowl. Mix until the batter is just combined. Scrape into the prepared pan and place in the oven. I have never heard of making banana bread into a cake like this! Banana bread is one of my favorite breads to bake at home. This sounds like an amazing twist on banana bread to try. The rum gives it a subtle but flavorful kick, and baking it in a cake pan gives you more of that nice, sticky top. I love how banana bread and banana cakes solve the global epidemic of browning bananas the world over ;o) I make an allergy friendly banana bread all the time for my family (I’m allergic to babanas unfortunately so I never get to enjoy it) Will have to try turning it into a cake and maybe adding a chocolate based frosting of some sort to it! Thanks for the inspiration! This look delicious! My mother makes a great banana bread and she got me hooked! I will have to try this! This looks so good. I like a good banana bread but never thought about turning it into a cake. I’m pinning because I’m sure I’ll be making this soon. Awesome! Let me know if you give it a try. I just love making banana cake, it’s so much better than just plain banana bread. I usually bake mine on a sheet pan and cover it in a cream cheese frosting … soooo good. My family is never out of bananas! We love the stuff…my hubby makes his shakes with it. My daughter grabs one just before she heads for school. As for me, I will try making your recipe. Looks delish! Bananas seem to have a permanent place on our kitchen counter, too… unless I suddenly scoop them all up for banana bread! This is right up my alley as I don’t see where this recipe uses nuts. I like my banana bread without them! To make it like a cake is just plain genius! Oh you hit it out of the park again, I LOVE banana bread and I like this with the sour cream. Who knew!!!! Will try it in the next few weeks xoxoxo I love making it on a Sunday night, for Monday breakfast as a treat to the start of the week! I haven’t gotten to try the other one out yet, but I’m looking forward to it! My last version of this one I spilled too much rum in by accident… but it was still delicious! Wow this looks so good! I make banana bread all the time because my husband just loves it. This looks so moist and delicious and I think he would love this as well. He will probably want m to add walnuts though. Walnuts are no problem. If you want to add a whole lot of them, just scoop out a bit of batter so that the pan doesn’t overflow when baked. I used to make banana bread in a round casserole dish. It was actually one of the first things I ever made. This is bringing back such great memories. I can’t wait to try this! That’s neat! I hope you like this version. It’s especially delicious for breakfast! Banana bread is one of my weaknesses but a cake? Soaked in rum? Going to make 5 right now!!! Thanks for a great recipe! Thank you for stopping by! That rum flavor just gets me every time. I crave this banana cake every other day, I swear! OMG, I want this in my belly ! Haha maybe, well yes definitely. I definitely have to try this, it looks amazing. I already LOVE banana bread, and soaked in rum?! It’ll be a hit with my family! Thanks for sharing girl! I accidentally spilled twice as much rum in recently… that was some fortified cake! This bread looks phenomenal! I love the healthy swaps you made ? I’m sure all these flavors combine to make one delicious loaf.